Cross that one off Chris Sale's bucket list. Prior to Saturday night, he had never beaten Tigers ace Justin Verlander. The Red Sox scored eight runs off the Detroit bullpen to win 11-3 at Fenway Park and improve Sale's record to 8-2. Boston jumped out to a 2-0 lead in the bottom of the third on a sacrifice fly by Dustin Pedroia and an RBI single by Mitch Moreland (pictured). The game see-sawed from there with the Tigers tying things up in the fifth. Andrew Benintendi got the lead back in the bottom of the inning with a sacrifice fly, only to see Miki Mahtook tie the game again with a run-scoring single in the top of the sixth inning. 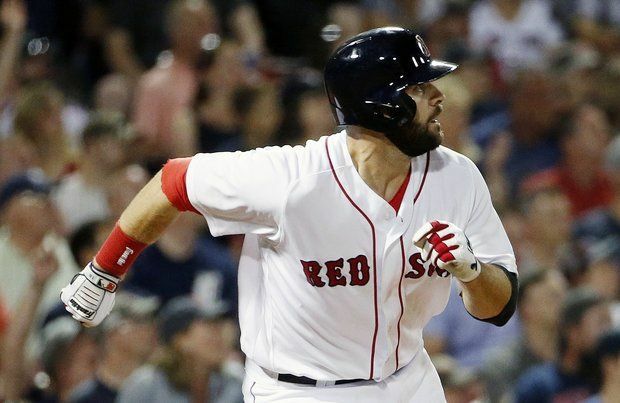 Boston regained the lead scoring three times in the bottom of the seventh on a two-RBI double by Moreland and a Josh Rutledge run-scoring single. They added five more in the eighth on a Xander Bogaerts RBI double, a two-run single by Benintendi, a bases-loaded walk to Rutledge and a sacrifice fly by Sandy Leon. Bogaerts had three hits in the win, improving his batting average to .322. Pedroia, Moreland and Rutledge each had two hits. Sale went seven innings for the win striking out nine and not walking anyone. Jackie Bradley Jr. made another spectacular play in the first inning with a diving catch in center to save a run. He's become a Gold-Glove highlight reel on a nightly basis with his defense.